This winter I used a herbal face wash specially formulated for normal to dry skin. Normally I would have chosen a strong anti-bacterial face wash for my acne-prone, oily skin. But as I had mentioned in my previous post, this year the chilly winter air nearly altered my skin’s texture making it itchy and dry. That’s why, these days, I completely avoided using masks/scrubs having even the slightest drying effect. 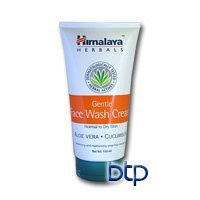 I wanted something gentle for my skin and so I purchased this Himalaya Herbals’ Gentle Face Wash Cream, meant for normal to dry skin. It has a creamy base and a lovely herbal aroma. And the best part -- it is enriched with the goodness of cool cucumber and moisturizing aloevera. Besides, it is hypoallergenic, does not contain harmful chemicals and is not tested on animals. I just squeezed a little of it on my palm and after moistening my face with water applied it in gentle, circular motions. Then I splashed cold water on my face to rinse it off. It did not leave my face dry or stretched and I felt so cleansed and refreshed after using this. I have been using this 2 times everyday for more than a month and am quite satisfied with it. You could also give it a try if you skin is not too greasy. Hi I wrote about the drying effects of the winter on the skin and the great response my son had to Immune perfect. It is great and it is even being used on the skin of diabetics now.